Our Versace 19·69 shirts are brand new and guaranteed to be 100% authentic! Versace Abbigliamento V1969 Mens Dress Shirt - ME16-101BV-107 - Small 14 1/2 (more info) — only 4 left! 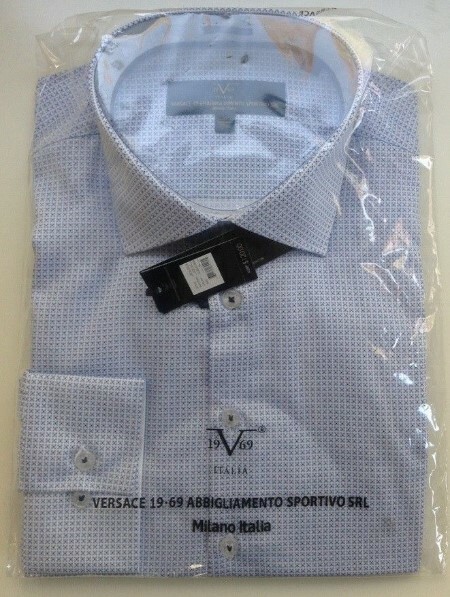 Versace Abbigliamento V1969 Mens Dress Shirt - ME16-101BV-107 - Medium 15 1/2 (more info) — only 4 left! Versace Abbigliamento V1969 Mens Dress Shirt - ME16-101BV-107 - Large 16 1/2 (more info) — only 4 left! Versace Abbigliamento V1969 Mens Dress Shirt - ME16-101BV-107 - Exra Large 17 1/2 (more info) — SOLD OUT!